2Department of Chemistry, University of Lucknow, Lucknow, INDIA. 3Botany and Pharmacognosy Department, CSIR-Central Institute of Medicinal and Aromatic Plants, P.O. CIMAP, Lucknow, INDIA. 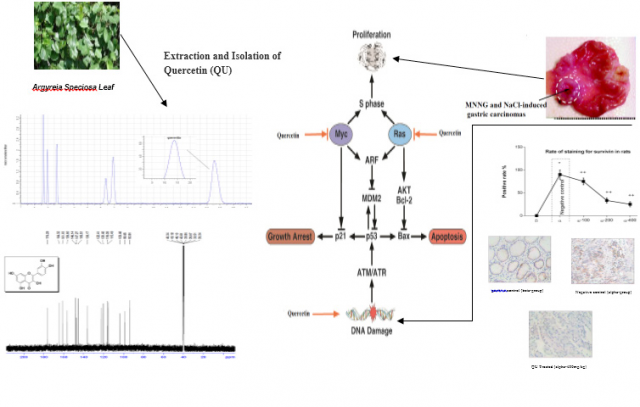 Objectives: This study was carried out to investigate the chemo protective potential of Quercetin, an isolated compound from Argyreia speciosa, on N-methyl-N-nitro-N-nitrosoguanidine and NaCl-induced gastric carcinomas in Wistar rats. Methods: The rats were fed with a diet supplemented with 8% NaCl and simultaneously given N-methyl-N-nitro-N-nitrosoguanidine. After administration of the carcinogen, quercetin was administered. The whole stomach and a part of duodenum were sampled, cut open and tumors were recorded. The specimens were histopathologically investigated and the expression of surviving was examined with immunohistochemical analysis. Results and Conclusions: The treatment with quercetin significantly increases body weight in the rats after N-methyl-N-nitro-N-nitrosoguanidine administration. Survivin expression in glandular stomachs of normal rats, of rats in adenocarcinomas and quercetin at dose dependent manner treated rats were 0%, 90%, 75%, 33.3-25%, respectively. Compared with the survivin expression in negative rats, the differences were significant. Compared with the survivin expression in normal rats, the differences were significant. Histological observations of stomach tissues too correlated with the biochemical observations. These findings indicated that the Quercetin treatment could stimulate immunity activity in rats with N-methyl-N-nitro-N-nitrosoguanidine induced gastric carcinoma and have pronounced effect on survivin which is an attractive target for gastric cancer therapy. Azmi L, Shukla I, Gupta SS, Chaudhary A, Kant P, Yadav NP, et al. Evaluation of Chemoprotective Effect of Quercetin from Argyreia speciosa against N-methyl-N-Nitro-N-Nitrosoguanidine and NaCl-Induced Gastric Carcinomas in Wistar Rats. Pharmacognosy Journal. 2018;10(2):215-220.